Free Shipping Included! 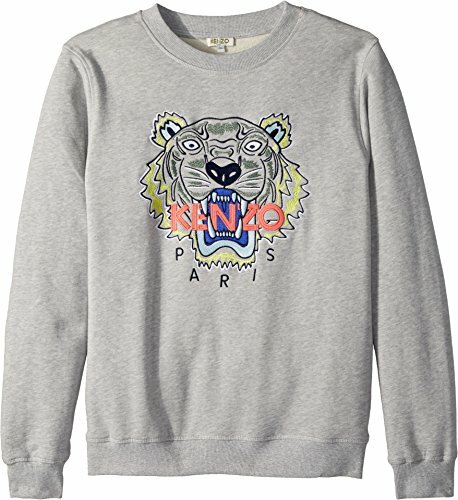 Kenzo Kids Girl's Sweat Classic Tiger (Big Kids) MARL Grey 14 by Kenzo Kids at Blood of The Young. MPN: KL15528. Hurry! Limited time offer. Offer valid only while supplies last. Hear him roar with excitement over this Kenzo™ Classic Tiger Sweatshirt. Embroidered brand name and tiger motif at center front. Crew neckline. Hear him roar with excitement over this Kenzo™ Classic Tiger Sweatshirt. Embroidered brand name and tiger motif at center front. Crew neckline. Long sleeves. Ribbed cuffs, collar, and hem. Straight hemline. 100% cotton. Machine wash cold, line dry. Imported. This item may ship with an attached security tag. Merchandise returned without the original security tag attached or a damaged tag may not qualify for a refund. Measurements: Length: 26 in Product measurements were taken using size 16A (16 Big Kids). Please note that measurements may vary by size. Hear him roar with excitement over this Kenzo™ Classic Tiger Sweatshirt. Embroidered brand name and tiger motif at center front. Ribbed cuffs, collar, and hem. Straight hemline. 100% cotton. Machine wash cold, line dry. Imported. This item may ship with an attached security tag. Merchandise returned without the original security tag attached or a damaged tag may not qualify for a refund. Measurements: Length: 26 in Product measurements were taken using size 16A (16 Big Kids). Please note that measurements may vary by size.